I haven't commented on here about this yet, but the Bearcats are rolling early this year and have rightfully earned a lot of national attention for this early part of the season usually reserved for the established programs. But while Cincy may not be an established program yet, it seems like they may be well on their way to defending as Big East champs and going to their second straight BCS bowl game. So far Senior QB Tony Pike has looked masterful running the high tempo offense that clearly confused and worn out all three opponents the Bearcats have faced. Aside from Pike's large size (6'6") and ability to scramble if need be, his accuracy on both the long and short balls has been incredible to watch (imagine a more athletic Ben Roethlisburger who can pass accurately and throw the deep ball). Another welcome change has been the terrific play of the offensive line. Last year's line was riddled with holding penalties, false starts and allowed defenses to put a lot of pressure on Pike at times. This year Pike has barely been touched and penalties have been so few and far between that you might have forgotten what it's like to actually set yourself back on offense. The great play by the offensive line is really symbolic of the overall team that looks extremely well-coached and ready to play. It's not often that you get a conference game with so much importance as UC's road game at Rutgers in week 1, but it's ever rarer that a team comes out and plays so flawlessly as the Bearcats did. As for the offense appears to be better than advertised with a confident Tony Pike who is currently in the top five for Heisman candidates. In a nutshell, the offense is scary good. The defense was the big question mark as 10 of the 11 starters from a year ago graduated and Kelly's defensive recruits are now on the field, and like the offense, the defense has been better than advertised. They're putting pressure on the quarterback, forcing turnovers, and holding teams to low point totals. Before week 1 the Bearcats weren't even in the Top 25 in either poll. Now after three straight impressive wins the Bearcats have moved up to #14 and #15 in the AP and USA Today polls respectively. Combine the impressive start with the remainder of a season in which the Bearcats should be favored, and early struggles by other top teams, and you have yourself an interesting scenario. 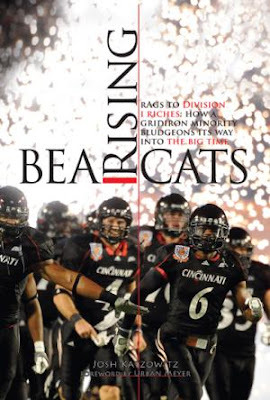 Bearcats vs. Gators in the National Championship Game on January 7th in Pasadena, California. The Bearcats play Fresno State at home this weekend at noon. Fresno State is coming off close and tough loses at Wisconsin and at Boise State, and should be another nice game for the Bearcats. The UC Athletic Department has announced that this game, and games against Louisville and West Virginia are all close to selling out. So get your tickets now and remember to wear white to this weekend's game against Fresno State. Go Bearcats! I can't wait for UC to pass up OSU in the rankings. WVU game is now sold out!